Established in 1994 as Bodog, Bovada is a U.S.-facing rebranding of the Bodog brand. Bovada.lv offers a poker room, a sportsbook and a casino, which is accessible via a mobile app. Both the casino and the mobile casino use the same account, so all available promotions apply to both, and users can transition back and forth between them seamlessly. To get started, click here to visit Bovada and register an account. You do not have to make a deposit to peruse the mobile website and see all that it can do! Please use your REAL information, as you will have to verify your account when making your first withdrawal! If you want to play any of the mobile casino games, you will need to make a deposit. Bovada now offers Bitcoin as a deposit method, which is great because depositing via Bitcoin has NO TRANSACTION FEES! You can read more about Bovada and Bitcoin here. We highly recommend depositing via Bitcoin, and if that is something you are interested in doing, we also recommend using Coinbase for all your Bitcoin transactions. Coinbase makes using Bitcoin as easy as using Paypal. After making your deposit, you should immediately claim the Bovada Casino bonus code of your choice. The Bovada Casino currently has two different bonus codes to choose from when making your first deposit. The first is SLOTS500 which limits you to playing slots while earning the bonus, and the other is GAMES250 which allows for more games but still restricts you from playing certain games with regards to the bonus. Both bonus codes are compatible with any mobile play. If you like playing the slots, we recommend redeeming the bonus code SLOTS500. The SLOTS500 bonus code provides a 100% match on your first deposit for up to a $500 bonus. The bonus amount of up to $500 is given to you upfront for you to play with. The bonus money can itself never be withdrawn, but winnings from playing the bonus money can be withdrawn – but ONLY AFTER you have completed the wagering requirements. In the case of the SLOTS500 bonus code, there is a 25x wagering requirement on the sum of the deposit and bonus amounts. This means if you deposited $100, you would receive a bonus of $100, and then have a wagering requirement of 25 x $200, which is a total amount of $5,000. This does not mean you have to lose that amount, just play that amount. So if you started playing slots with the $200 as described above, and you won some and lost some and after playing $5,000 worth of coins, you ended up with $250, you could then withdraw a total of $150 (your deposit plus your winnings, the bonus amount cannot be withdrawn). With the SLOTS500 bonus code, you may ONLY play slot games. The GAMES250 bonus code offers a 100% match on your first deposit for up to a maximum $250 bonus. Just like the SLOTS500 bonus, the bonus amount can only be played with and never withdrawn. The GAMES250 bonus code has a 40x wagering requirement but allows you to play more than just slot games. However, the following games are still not allowed to be played when meeting the wagering requirements – Roulette, Craps, Single Deck or Double Deck Blackjack, Baccarat, or Sic Bo. You may redeem the SLOTS500 bonus code AND the GAMES250 bonus up to 4 times EACH, meaning you could receive up to $2,000 in slots bonuses and another $1,000 of games bonuses for a total of $3,000 in bonuses over your first eight deposits! Click here to visit the Bovada Casino! Bovada has a bet tracker mobile app available for all of the major platforms, including Android, BlackBerry and Apple iOS – however this app only provides the latest betting odds and scores, it is not itself and betting or gambling app. To download and install the app, users have several options: use the QR code on the Bovada website or get it through Google Play, iTunes, BlackBerry World or a similar option. To actually bet, you can use the streamlined, mobile-friendly website. The Bovada website will automatically detect your device and present the mobile website if you arrive via your mobile device. After registering your new account, log in to the Bovada website on your mobile device. There is a mobile menu at the top right corner which allows you to switch between Sports, Casino, and Poker, as well as options to read the articles found on the Bovada website. Upon selecting the Casino option, you can scroll around to view the Popular Games, Slots, Blackjack Games, Video Poker, and Specialty Games. You can also view the Casino drop down menu to filter only specific games. At the time of this writing, there were 99 mobile slot games available to choose from, 8 video poker varieties, and 2 blackjack games! 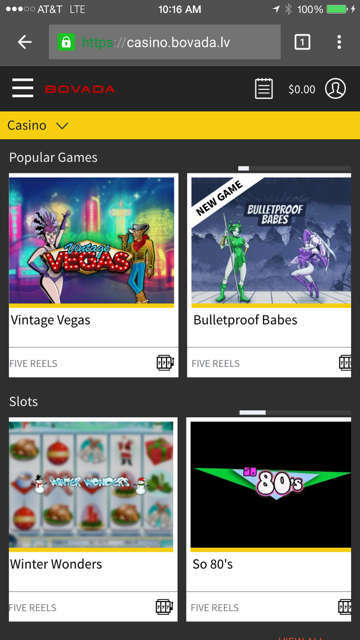 The most popular games at the Bovada mobile casino are its 3D slot machines, which include Mr. Vegas, Safari Sam, SlotFather and Three Wishes. The mobile versions of these slots are identical to their instant-play counterparts. The mobile casino also has Lucky 7, which is a classic pub-style slot machine. The mobile casino’s other popular games include blackjack and European roulette. If the player’s device is a powerful enough to access Bovada as a desktop site, then it can access a wide range of other instant-play games as well. The mobile casino is full featured, yet simple and straightforward. Each game is represented as “card” on the main screen, and you can scroll horizontally to view more games in that category. Below are screenshots take from my iPhone! 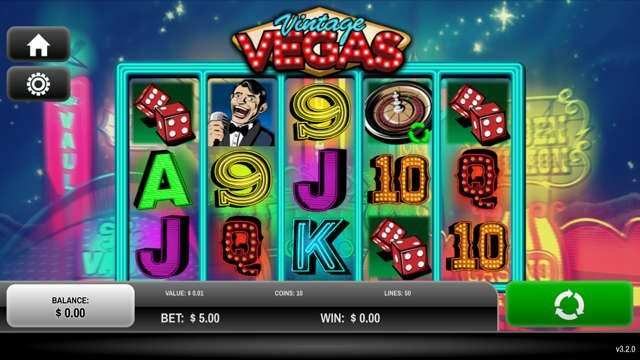 The only progressive jackpot currently available on Bovada mobile is Mr. Vegas, which has access to the same progressive jackpot that the standard casino version of the game uses. The jackpot is usually between $7,500 and $15,000. The Bovada casino welcome bonus is available to all new players and is worth as much as $3,000. It’s also broken down into eight independent promotions, so players don’t have to cram it all into one deposit, and they can pick and choose which options they want to take advantage of. The first promotional code is SLOTS500. The code can be used on four unique deposits, and it matches each of those deposits by 100 percent up to $500. This bonus only applies to slot machines. The second promotional code is GAMES250. The code can be used on four unique deposits, and it matches each of those deposits by 100 percent up to $250. All bonus money is subject to a rollover requirement before a player may withdraw it or any winnings derived from it. For SLOTS500, the rollover requirement is 25 times. Therefore, if a player took full advantage of a $500 bonus, he or she would have to bet $25,000 in order to clear it. For GAMES250, the rollover requirement is 40 times. Therefore, if a player took full advantage of a $250 bonus, he or she would have to bet $20,000 in order to clear it. Note that these bonuses only apply to games found in the casino and mobile casino and not, for instance, in the poker room. For more detailed information on the Bovada bonus code click here! Bovada offers Casino Benefits, a loyalty program that awards points for slots, video poker, blackjack and other table games and converts them into bonus cash. Regular weekly promotions include Happy Hour Thursdays, Video Poker Wednesdays and Blackjack Sundays. Bovada also usually has a seasonal promotion that lets players accrue bonus chips and have access to special reload bonuses. Also visit BettingSitesUSA.net for other online sportsbooks available to USA players. Get lucky at the Bovada Casino!